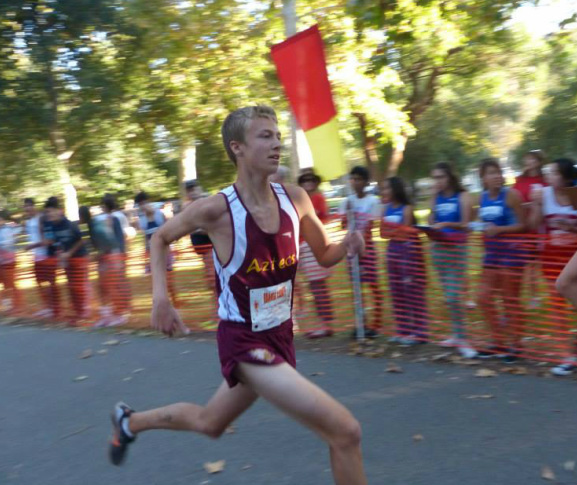 Junior Brandon Powell 2nd team All Century League, 20th place. Junior Dakota Rodriguez (pictured) en route to finishing as the Aztec's 5th man. Placed 8th out of 12 teams. Nathan Wilch (pictured left) placed 13th overall. Placed 4th out of 6 teams. Blake Harris finished 5th overall! Tim Romero finished 20th overall! Placed 7th out of 12 teams. Dakota Rodriguez finished 11th overall! Placed 20th out of 22 teams. 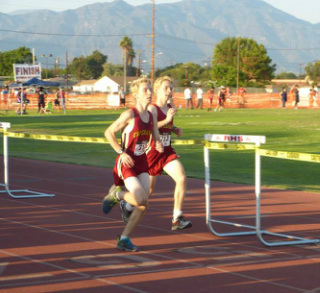 Athlete of the meet: Freshman Nathan Wilch finished 11th overall on the TEAM. Big 33 second PR as well! 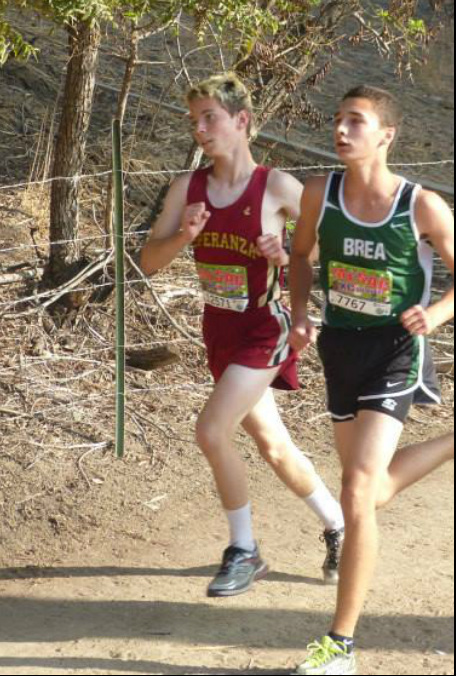 Junior Logan Fry finishing 16th place to help the Aztecs to a 55 point win over Northwood High School. Logan was the fastest 4th man on the day, out of all the schools that raced. 8 runners earned medals at Central Park Invite, including 5 freshmen! 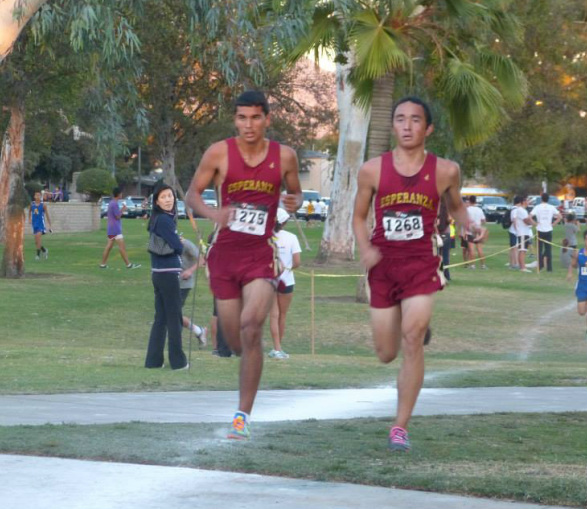 The Aztecs competed Wednesday October 2nd at Irvine park, in the first of two league meets. F/S finished in 7th place, JV finished in 6th place, and Varsity finished in 6th place. See the Green Sheets for more details. Great Day! 14 Personal Bests. The Aztecs spent the weekend up in Palo Alto, CA, September 27-29th, 2013. 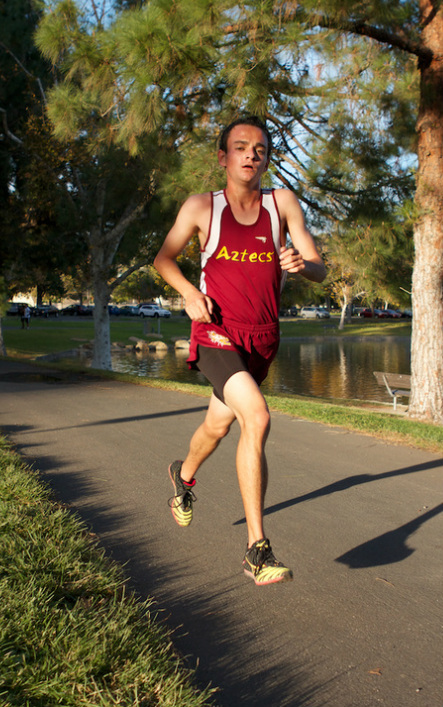 Competing in the Division 3 race, led by Senior Josh Park, the Aztecs placed 13th out of 30 teams. Sophomore Blake Harris made his Varsity debut and finished as our 5th man! 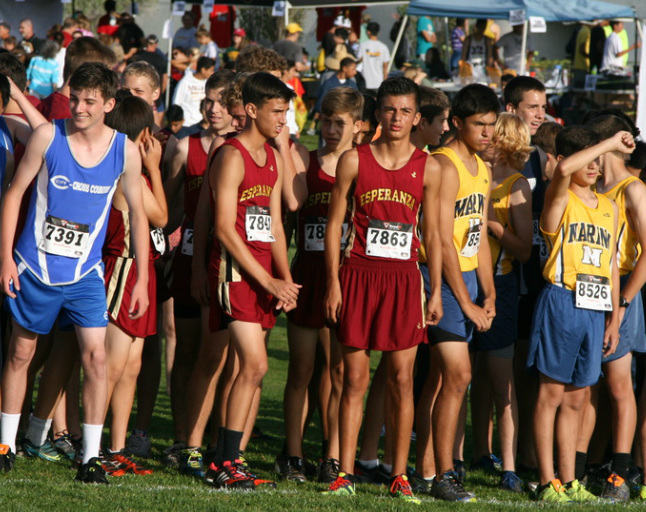 Pictured: Park, Mosqueda, Harris B.
Juniors 4th - 24 teams *Brandon Powell 18th place 15:58, Logan Fry 22nd place 16:20, Dakota Rodriguez 16:24 25th place.